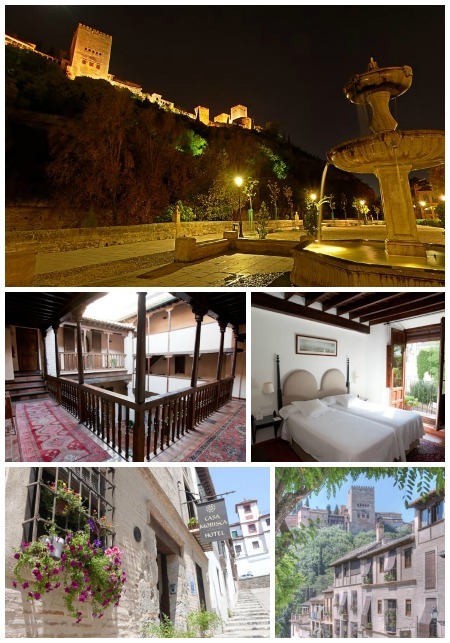 For those brave enough to drive into the city and park-up in the shadow of the Alhambra, at the top of the list must be the much-loved boutique hotel Casa Morisca in the historic Albayzín district. The location could not be better for access to the Alhambra, which is only 15 minutes on foot, and for exploring the Albayzín, amongst all that the city centre has to offer. The building itself is an old noble house dating back to the 15th century and has been lovingly restored by renowned Granadino architect, Carlos Sanchez. It features a traditional inner courtyard with water pool, which is over-looked by internal galleries on four sides. There are five types of room to choose from, ranging from Standard to the Mirador with Alhambra views. All are beautifully decorated and have have TV, Wifi and air conditioning. There is free parking available opposite the hotel and they recommend that you contact them in advance to reserve a place and to get driving directions. If you are looking for a bit of much deserved luxury and pampering, after a long drive and negotiating Granada’s one way streets and bus lanes, consider Villa Orinia, located in the heart of Granada City. Set in a 19th century manor house, that has been carefully restored in the traditional Andalucían style, Villa Orinia offers plenty of spaces for you to relax and unwind, including the garden, the inner patio and the spa. 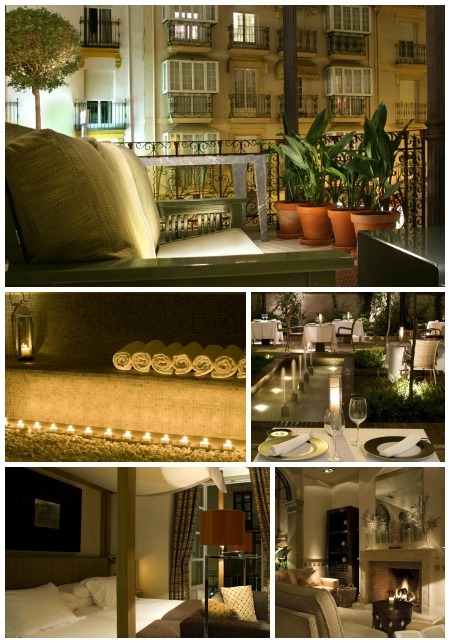 As well as a gym, the spa offers various tempting body and facial treatments. The hotel also boasts the fabulous La Fábula restaurant led by chef Ismael Delgado, who was awarded a Michelin star in 2008. This would be a fabulous setting for a romantic meal for two. Villa Orinia offers 31 stylish and spacious rooms and suites, all with TV, air conditioning and Wifi. If you are travelling with a furry friend, take a look at luxurious, and pet friendly, Palacio de los Patos, located not far from the the Cathedral. Old meets new in this elegant hotel set in a UNESCO-protected 19th century palace. 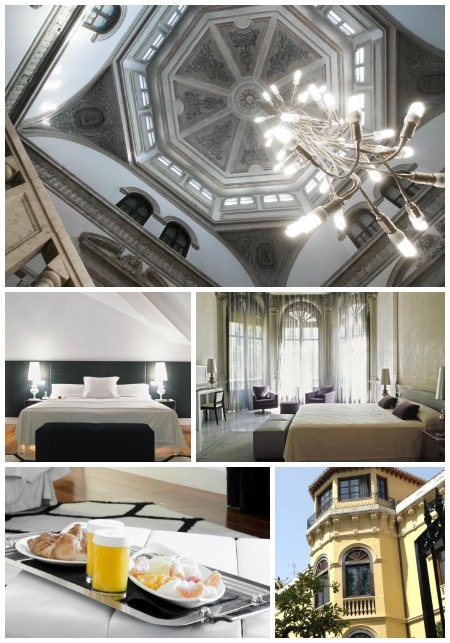 The hotel offers 40 beautifully light, airy rooms either in the Palacio itself, where original features have been conserved alongside contemporary refurbishment, or in the modern wing where the sleek décor is considerably more minimalist. The hotel’s restaurant serves fresh, healthy cuisine in the Andalucían culinary tradition, and the garden, featuring Arabian-style fountains, provides an oasis of peace in the city centre. All air-conditioned rooms have flat-screen satellite TV, WiFi, safe and minibar. The hotel spa, which includes a sauna, Turkish bath and indoor pool also offers massage and other beauty treatments. Pets are allowed on request. On-site parking is available (reservation is needed) and costs €24 per day. 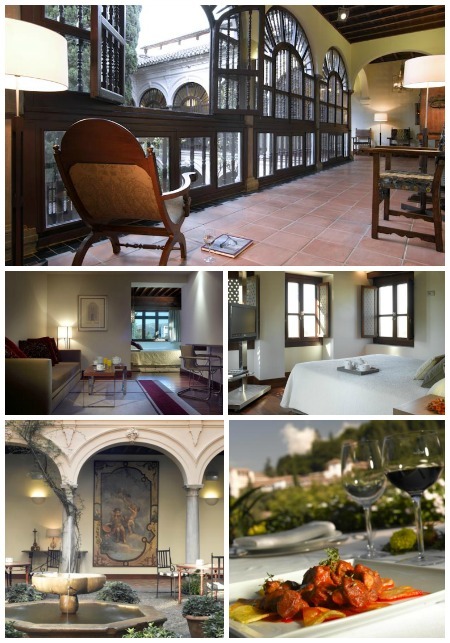 Arguably Granada’s most famous hotel, with relatively easy access by car, is the beautiful Parador de Granada. Set in the 15th century San Francisco Convent, within the grounds of the Alhambra itself, this hotel is steeped in history and boasts one of the most romantic locations in the city. This historic building offers an effortlessly stylish combination of original features, such as stone archways, beamed ceilings and antique furnishings with smart, contemporary décor. Each of the Parador’s 40 rooms has free internet access, a flat-screen TV and air conditioning. Free private parking is available on site without reservation and you do not need to drive through the city to get there. Do note that you will need your hotel booking details handy to gain entrance to the Alhambra complex. If you are looking for a self-catering option Apartamentos Turísticos Las Nieves are a great choice, especially for families. 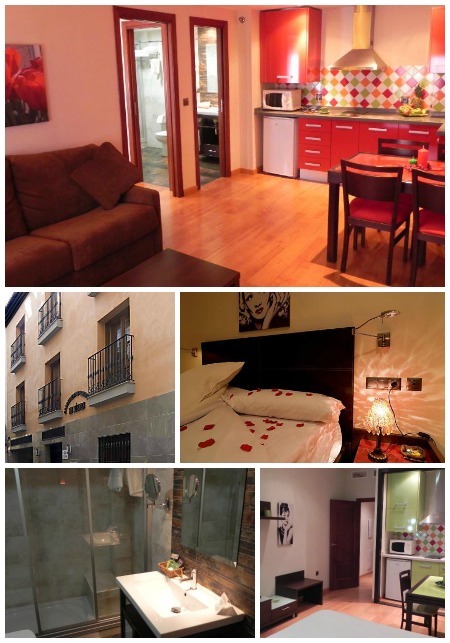 They are very conveniently located in central Granada, just five minutes from the Cathedral on foot. The apartments are also about 10 minutes walk from the lively Calle Elvira and the winding back streets of the medieval Moorish district of Albayzín. You can walk to the Alhambra Palace in around 20 minutes. The Las Nieves apartments are well furnished and feature bright, stylish interiors with parquet floors. They offer modern, air-conditioned rooms with free Wi-Fi, satellite TV and DVD player, a private balcony and daily maid service. The kitchens are equipped with hob, fridge, microwave and toaster. With the choice of studio apartments, one bedroom (sleeps 4) and two bedroom apartments (sleeps 6) Las Nieves are a suitable for families, couples and business trips. Parking available on-site (depending on availability) or public parking within 200m at €15 per day. Click on a location marker or the list below the map to bring up the info box, and directions, for each hotel. You can also drag the little yellow man from the top left corner onto the map to get a street view.